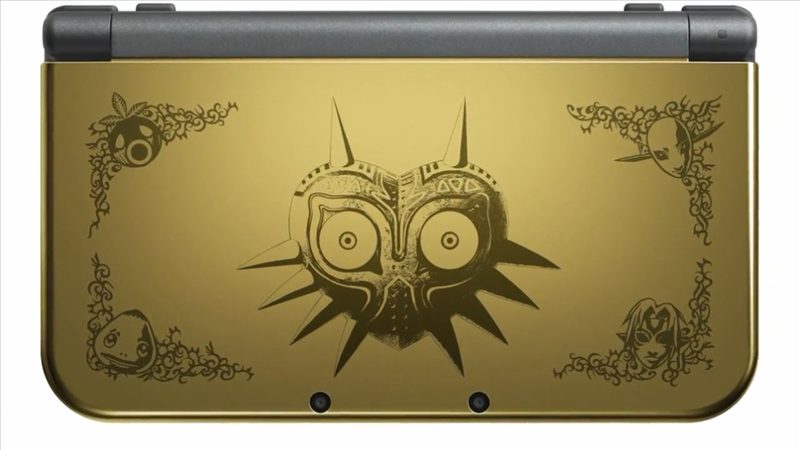 We’re updating this post with all the latest information on the hot limited edition Majora’s Mask New 3DS XL. Updates will be listed in reverse chronological order, with the newest info we have on top. UPDATE 25 (3/24, 1:58pm): It’ll be back at GameStop tomorrow. UPDATE 24 (2/13, 5:13pm): And now Target is cancelling orders too. Jesus. They’re giving out $15 gift cards, which is $35 less than what Best Buy gave out when they oversold. UPDATE 23 (2/13, 11:02am): Looks like both GameStop and Target are sold out now. UPDATE 22 (2/13, 10:42am): And now GameStop is selling a Majora’s Mask Collector’s Bundle that includes both the gold 3DS and the collector’s edition of the game for $250. Looks like this one is online only. UPDATE 21 (2/13, 9:52am): There are some in stock online at Target right now. UPDATE 20 (2/12, 5:53pm): We’ve been keeping an ear to the ground, but as of right now, it seems like Target is the only outlet that will have a limited supply of extra Majora 3DS systems for sale when the system is released tomorrow. Check with your local store if you’re interested. We’re keeping an eye out to see if GameStop, Best Buy, and other stores might also have the system in stock on release day. At this point, if you want one of these things, your best bet might be to line up at your local store on February 13 when they officially come out. UPDATE 17 (1/23, 11:21pm): Best Buy oversold and has cancelled a ton of pre-orders. This really stinks. Though they won’t give specifics as to how they’re rolling out pre-orders, they’re promising that west coasters will have a fair shot this time, so call your local store and cross your fingers if you want one. UPDATE 15 (1/23, 11:16am): Some GameStops are again taking a limited amount of in-store pre-orders, so call your local store and see if they’ve got one. Just called my store on 86th Street and Lexington here in Manhattan and they’re taking pre-orders right now. Be warned: you’ll have to pay in full, same as last week. UPDATE 14 (1/22, 3:02pm): ...and it’s gone. That was fast. UPDATE 13 (1/22, 2:45pm): It’s up on Fry’s right now. I just tried to go through the process and it didn’t work, but readers are telling me they’ve successfully ordered systems, so GO GO GO. UPDATE 12 (1/22, 9:40am): For some unfathomable reason, Target decided to take a bunch of Majora’s 3DS orders at around 3am ET last night, when most of North America was asleep, myself included. Of course, the system sold out in minutes. We’ll let you know if they reopen pre-orders. UPDATE 11 (1/21, 7:31pm): Sorry for the lack of updates, guys—there hasn’t been much news to share, sadly. Today a lot of people are telling me their Best Buy orders were cancelled, but it only appears to be for people who bought more than one. Presumably that will free up some new systems, but who knows? The Majora’s 3DS listing is still MIA from their website. As always, I’m keeping an eye out, and as soon as I hear about something, I’ll update this post as fast as humanly possible. UPDATE 10 (1/18, 1:18pm): Two updates today, neither of them particularly huge. One is that we’re hearing rumors about Best Buy cancelling some preorders—but we haven’t been able to confirm that. It appears they’ve actually removed the Majora’s 3DS listing from their website. The second update is that Play-Asia says they’ll be taking pre-orders soon, though there’s no indication when that’ll start. We’ll keep an eye out. UPDATE 9 (1/16, 8:06pm): Nintendo’s website listing has now changed from “coming soon” to “pre-order currently unavailable.” Don’t despair, though: we’re still keeping an eye out and will update this post if we see the system for sale anywhere soon—though now that it’s the weekend, things may be slower. We’ll keep an eye out for GameStop news on Monday. Also, remember, there’s always a chance there will be extra systems on the shelves at your local retailer when it comes out next month (February 13). UPDATE 8 (1/16, 5:07pm): A number of readers have reached out to tell me that GameStop contacted people whose Majora’s 3DS orders were rendered incomplete by lag on the website. Those people—who can still get the system—have until Monday to pay in full. If they don’t pay, those pre-order slots could reopen for new people, so we’ll keep you updated if we see GameStop (or anyone else) taking new orders next week. UPDATE 7 (1/16, 9:55am): We’ve been monitoring all the retail sites but have yet to see pre-orders reopen anywhere. We’ll let you know if that changes. Some gross scalpers are already selling overpriced units on eBay and Amazon. A couple of readers have said they heard that Best Buy may be taking in-store orders in the near future, but we haven’t been able to confirm that. UPDATE 6 (1/15, 1:31pm): The bad news: Nintendo World in NYC is sold out, according to multiple readers. The good news: Nintendo of America’s website says pre-orders on the Majora 3DS are coming soon, so we’re keeping an eye out to see when that happens. UPDATE 5 (1/15, 10:00am): We’re still keeping an eye out for pre-order availability. Right now, UK readers can pick up the system over at Nintendo’s official website. If you live in or near New York City, you can head to the Nintendo World Store in Rockefeller Center and pre-order the system, though there’s currently a big line, so I’d get there fast. We’ll let you know if we see this 3DS pop up at any other retailers—and of course, let us know if you see it anywhere. UPDATE 4 (7:48pm): That was fast. Best Buy is now sold out online, although in-store options may be coming soon. No word on other options yet. We’ve reached out to Amazon PR to see if they’re going to offer it, but haven’t yet heard back. UPDATE 3 (6:39pm): Best Buy has it up now. GO GO GO. We’ll keep updating this post as things change. UPDATE 2 (1:45pm): GameStop confirms: they’re sold out. For now, at least. UPDATE (1:15pm): We’re getting reports from people across the country saying that GameStop stores are now totally sold out of this limited 3DS. Still no word if/when other retailers will start offering it. We’ll keep you updated as we hear more. It took just 15 minutes for GameStop to sell out of the fancy new Majora’s Mask-themed New 3DS XL online, and if you’re anything like me, you were totally bummed out when you saw that big grey “Not Available” on the retailer’s website, taunting you. Fortunately, you can still get your hands on one—you’ll just have to do some traveling. I just got one at the GameStop in Manhattan’s Union Square, where it seemed like the phone was ringing every 30 seconds with people asking about the Majora’s Mask 3DS. You might not have the luxury to wait more than a few hours, but if you get over to your local GameStop right now, you should be able to pre-order one of these sleek machines and get it sent wherever you want. At least one GameStop employee has told me that they’re already sold out, so move fast. Still no word on if/when it’ll be available at Amazon, Best Buy, or other retailers, so if you know you want one and can afford to put down all the money now, this might be your best bet. If you buy this 3DS through the retail links in this post, our parent company may get a small share of the sale through the retailers’ affiliates program.